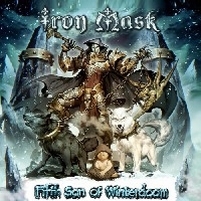 Iron Mask is back with Fifth Son Of Winterdoom. The opening passage of Back Into Mystery is quite symphonic, but then the song becomes a melodic power metal tune. And like on their last album Black Death Mark Boals takes care of the lead vocals. The lead guitar solo part is a bit too much, here it would have been smart not to add a Malmsteen-ish solo and keep the song more interesting. At the opening passage of Like A Lion In A Cage it's again Dushan Petrossi who shows off his talent and what might be a highlight for Malmsteen fans, lovers of neo-classical guitar frenzy and guitarists is boring others - like me. When the song finally gets going it's the repetitive chorus which is annoying... Quite heavy begins Only One Commandment and here the guitar play at the opening passage is more song supporting. When Mark Boals joins in the song becomes an 80's hard rock edge. After Seven Samurai they present the title track which is just over 10 minutes. First you hear footsteps in the snow, a child crying, then folk-ish music sets in. Actually it's a bit lengthy... This time no guitar frenzy, but I miss some twists and turns to make Fifth Son Of Winterdoom more interesting. Laughter kicks off Angel Eyes, Demon Soul, but the guitar-based tune is not getting me, somethings missing for me... It's a melodic metal tune and it should be up my alley... Rock Religion you can check out yourself as there is a video for this one. I would describe the track as a melodic heavy metal tune with an 80's edge... A bit Dio-esque. A power ballad with a melancholy touch is Father Farewell, a song Petrossi wrote for his deceased father. Next in line 2 melodic power metal tunes which are easier to get in, at least for me, probably because it lacks the neo-classical guitar play... The most catchy tune is Run To Me and with The Picture Of Dorian Grey they close this chapter. In my opinion the second half is stronger and I hope next time they concentrate on that facet of their sound. To be honest, I have mixed feelings about this album, so I can only recommend to check out several songs and make up your mind about it. 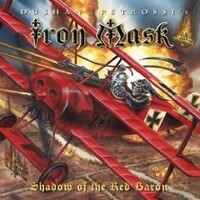 With Shadow Of The Red Baron Iron Mask stay on the chosen path, but improved in song writing. A recommendation to all fans of powerful melodic tunes with neo-classical elements. Check out: Shadow Of The Red Baron, Forever In The Dark, Dreams and We Will Meet Again.